It’s been 20 Years – What’s new with the Tarot Garden? 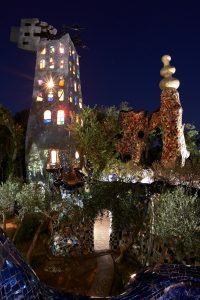 Niki de Saint Phalle’s Tarot Garden, Il Giardino Dei Tarocchi, is celebrating its 20th anniversary this year. For many years before its opening, people would just walk in and many met Saint Phalle there, working, having tea, or overseeing the construction. The garden was officially opened to the public in May of 1998, the project having started in the late 70’s and ending upon Saint Phalle’s passing in 2002. The Tarot Garden Foundation was established in 1997. Its mission is to maintain and preserve this monumental work of art. Many people helped Niki de Saint Phalle build her masterpiece. A number of the original crew continued working with the Tarot Garden Foundation, Ugo Celletti, Antonio Urtis, Marco Iacotonio, Claudio Celletti, Gian Piero Ottavi, and Alessia Celletti. Ugo Celletti was the local postman and slowly started helping in the garden, eventually taking on a great number of tasks. He remained working in the garden until his passing in 2016. Since opening, additional members have joined, Fabio Mancini, Massimo Menchetti, Alessandro Celletti, Dario Fortunato, Giulia Celletti, Giuseppina Fini. When Saint Phalle passed in 2002 all new work on the sculptures ceased. The focus turned to conservation, maintenance, restoration, and management of keeping the garden safe and efficient. Conservation is the main focus. With laws having changed in Europe regarding manufacturing of mirrors, new problems have surfaced with the replacement of some mirrors. Small stone walls were added near the back of the garden to help redirect rain runoff to avoid soil being carried away. The walls help redirect the water to preserve the garden’s landscape and paths. A well is to be added to draw water which will be utilized for irrigation of the garden’s plants. “Don’t Smoke” signs, also written in French, Italian and German, were added throughout the garden this past June due to the number of cigarette butts that were littering the grounds. Another addition to the garden is a cafe pavilion that currently is under construction. The cafe was designed by architect Mario Botta. He also designed the entrance wall to the Tarot Garden back in 1997. Botta graciously designed this in memory of his beautiful friendship with Niki de Saint Phalle. The pavilion will be used for reception and cafe services for visitors as early as March 2019. The number of visitors coming to the Tarot Garden has increased exponentially since it’s opening. During its first year in 1998, the garden had just over 18,200 visitors. By 2007 the park was receiving roughly 54,000 guests and by 2017 attendance had jumped to 109,900. With the significant increase in guests, focus has been on maintaining the sculptures, paths, and greenery of the garden to ensure Niki de Saint Phalle’s vision and concept, along with the visitors’ safety. The Tarot Garden is also considering opening earlier in the day during July and August to accommodate the increase in guests to the garden. In 2017 the parking lot was expanded for the same reason. Various solutions are being considered in order to preserve the experience of the Tarot Garden. With the sometimes heavy influx of people, the esoteric aspect of the experience is diminished. While no work can be done within the garden, there is one sculpture that is allowed to be moved, namely the Fool. His tarot card represents a new beginning in a journey, not knowing what to expect but with an unlimited potential. © Il Giardino Dei Tarocchi, All rights reserved. Photo: Katrin Baumann, 2011. Saint Phalle would change The Fool’s location, and had moved him twice in the past. He is currently installed by The World. He may be moved again in the future to keep him wandering, or not. His current placement reminds one of the current world migrations now happening due to war and climate change. The Tarot Foundation is also working on arranging small concerts to be held at the Tarot Garden. In 2000 a surprise birthday party was held for Niki de Saint Phalle at the Emperor’s Castle. Niki de Saint Phalle’s friend Marie-France Pestel-Debord, vice president of the Tarot Garden Foundation, organized for a band to play in the courtyard. Saint Phalle wanted concerts to continue being a part of the Tarot Garden and the Foundation plans to arrange some to happen in the near future. 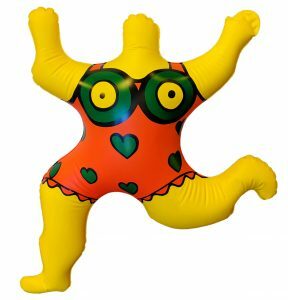 During her lifetime, Niki de Saint Phalle produced a number of fan articles and merchandise to fund her projects. Most of her projects during the 90’s were done to specifically fund the Tarot Garden. In a similar way, the Tarot Garden Foundation does the same to remain sustainable. One of those items Saint Phalle had created were inflatable nanas, of all shapes and sizes. With the help of the Niki Charitable Art Foundation and the company Jet Creations, the Tarot Garden is now selling again one style of Saint Phalle’s nanas. Different shapes and sizes are expected to be added during the coming year. The shop will also be adding puzzles and a children activity book. A detailed chronology, “Niki de Saint Phalle and the Tarot Garden” was published by Benteli in 2010. Authors Marella Caracciolo Chia and Jill Johnston share memories and facts about the gardens 20 years of construction. The text is accompanied by photos Giulio Pietromarchi took over the years. The book has been published in English, French, and Italian, and is available at the Tarot Garden or online through the publisher’s website (https://www.benteli.ch/en/art/the-tarot-garden-luxury-edition.html). In 2015 the Tarot Garden’s website received a major update. You can view the website in English, Italian, French, and German. An interactive map provides more information about each sculpture and its placement in the garden. Have feedback for the Tarot Garden? You can go to the website (http://ilgiardinodeitarocchi.it/en/contact/) and share your thoughts with the Tarot Garden Foundation! It’s been 20 years since the Tarot Garden officially opened to the public. 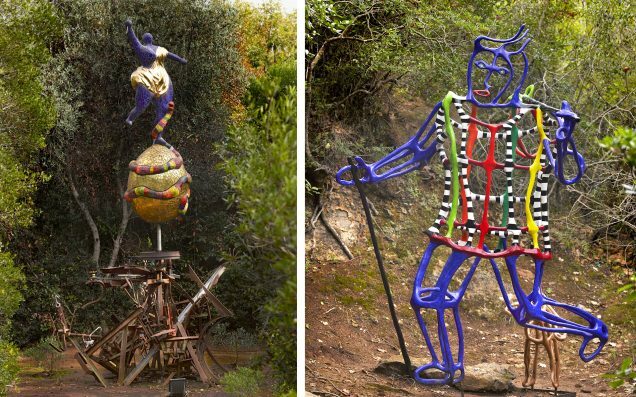 With more and more people discovering Niki de Saint Phalle’s Il Giardino Dei Tarocchi, the Tarot Garden Foundation will continue to maintain and conserve it, so visitors can enter and become immersed in a part of Saint Phalle’s magical world. Want to know more about the Tarot Garden? Copyright © 2007-2019 Niki Charitable Art Foundation. All Rights Reserved.